Record your personal working time to-the-minute with the InLoox stopwatch. Afterwards you can assign the recorded working time directly to a project. 1. 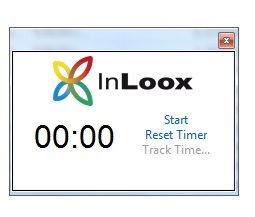 Open the InLoox now or InLoox PM tab and click on Stopwatch. Click on Start, to start the recording. Click on Pause, to pause the recording. If you want to reset the stopwatch, click on Reset Timer. 3. To assign the recorded working time to a project, click on Track Time. 4. The dialog box Select Project will open. Select a project from the list and click on OK.
5. After that a new time tracking entry will open. The entry already includes the recorded start and duration of your activity. Add more information following the procedure described in Create and edit time tracking entries within a project in 4. 6. When you are finished click on OK.
Record working time with the InLoox stopwatch | InLoox 9 for Outlook • Copyright 1999-2019 © InLoox, Inc. All rights reserved.